I am not a domestic goddess. Go ahead and ask anyone who knows me. But even I can learn how to do stuff. Yes, I can be taught. Lately, I’ve been watching the “Arrange Your Own” videos from the flower subscription service HBloom. A flower subscription will send you a pre-arranged bouquet of flowers or a variety of seasonal flowers that you can arrange for yourself. But if you are not Martha Stewart, how the heck do you do it? 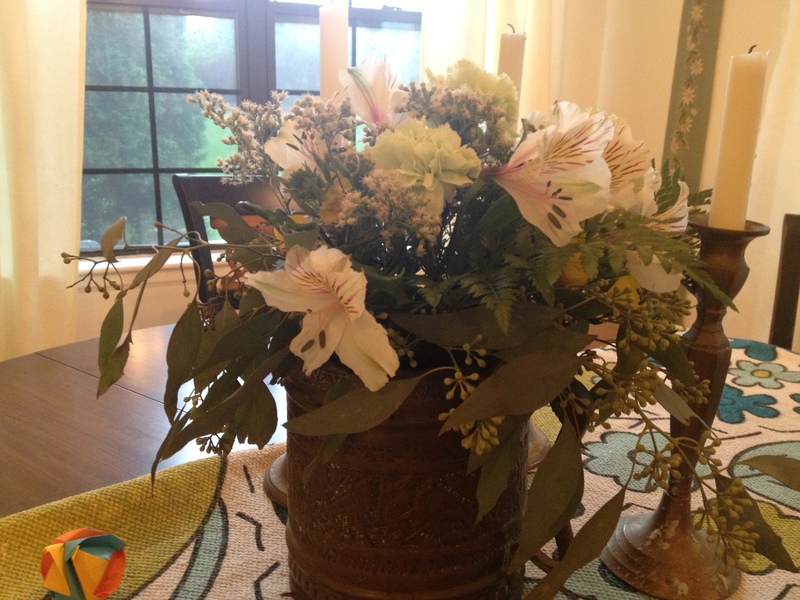 With HBloom’s Arrange Your Own videos, you can learn what you need to do to make a nice bouquet. And once you learn the tricks, using greenery as a structural element and all the weird things you can do with aspidistra leaves, you will start seeing all kinds of potential bouquets around you. I bought some posies today with some seeded eucalyptus and on the way home saw a whole lotta free flowers in vacant lots. So, I scooped some up and brought them home and made some arrangements. I am not a professional but I like the way they turned out. It’s very soothing and it’s amazing how quickly you will get used to ripping leaves off of stems. Too much fun. It’s not a high stakes activity. Just relaxing with a lovely payoff. This is a quick one. I found the blog Noahpinion as I was following a link from a silly article in The Atlantic from assistant finance professor Noah Smith at Stonybrook who thinks what the country really needs is 50 million more Asians. Having worked with Asians I can tell you that they’re just like any other immigrant group. Some of them are brilliant, some are average and some are highly overrated. And just like other immigrant groups, many of them work incredibly hard when they come here. But with so many of them laid off right now in my industry, I don’t think even they want 50 million more of them landing on our doorstep. How would Noah Smith like it if there was another continent called Financia and, having an excess of well-trained finance specialists, they all wanted to move here and teach finance? Not only that but because they stand out in a crowd with their blue hair, the hiring managers become fascinated with them and their well tested ability to express multivariate statistics without a calculator? How many adjunct professors could Stonybrook absorb? Think that over, Noah, and then, maybe you should get out more and see how the pharmaceutical industry and its hundred thousand of unemployed scientists are doing. I think we can dispense with the notion that we’re all bad scientists because we didn’t get laid off piecemeal. It was 19,000 at a clip. Hardly discriminating, wouldn’t you say, Noah? The last thing we need is more unemployed scientists who will work for peanuts. I think there’s a finance paper in that somewhere. Which brings me to the article that Noah discusses on his blog. It’s about a paper written by Daron Acemoglu and James Robinson about how all you really need to be a successful entrepreneur is an excess of hard work! Go Team America! I won’t even go into all of the details right now because it would take too long and my blood pressure wouldn’t like it. Given these assumptions, the result of the model is not hard to predict – when you let losers lose and winners win, innovators try harder. Not exactly a shocker, given the assumptions. So is this model counterintuitive? I argue: No. Instead, it is intuitive. It seems to have been built using intuition, and its results confirm commonly-held beliefs about the difference between “cutthroat” and “cuddly” capitalism. So I don’t think it makes much sense for Acemoglu and Robinson to defend their research from the bloggers by saying that the purpose of academic research is to be counterintuitive. OK, time for my second point. Mark Thoma wondered why Acemoglu, Robinson, and Verdier get the result they get. Isn’t it true that entrepreneurs have to take a lot of risk? And doesn’t that mean that social insurance, which reduces risk, should encourage entrepreneurs to take more risk, not less? How is it that Acemoglu et al.’s model avoids this effect? In other words, the authors have assumed away much of the risk of entrepreneurship! A failed entrepreneur gets paid exactly the same wage income as a worker who doesn’t try to be an entrepreneur at all! This automatic wage income reduces the risk of entrepreneurship substantially, and makes social insurance much less necessary for reducing risk. How realistic is that assumption? Well, in the real world, entrepreneurs in rich countries have limited liability, and can pay themselves wages out of their start-up capital. This means that many entrepreneurs can earn a wage even as they work to start businesses. But this wage is often much less than they could have earned otherwise, and if their business fails (a statistically likely event), they will be unemployed. So the “no occupational choice” assumption probably reduces the risk of entrepreneurship, relative to the real world. Also, the authors assume that entrepreneurs do not put up any of their own wealth as startup capital for their ventures, and they assume no heterogeneity between worker/entrepreneurs. This means that it is just as easy – and no more risky – for a poor person to start a successful company as for a rich person to do so. Your probability of success depends entirely on how hard you work. So to combine my two points: When it comes to this kind of modeling, what you get out is pretty much what you put in. If you start off with the intuition that success is a function of how hard you work, and how hard you work is a function of how much the government will let you keep your hard-earned gains – in other words, if you start off with the intuition of pretty much every middle-aged conservative guy in America – then your model will probably spit out the result that countries face a tradeoff between redistribution and innovation…again, fitting perfectly with the intuition of pretty much every middle-aged conservative guy in America. Pretty much. Let me just add that the likelihood of this miraculous success coming out of the biotech world from all of the laid off scientists who don’t have the money for the start up costs to become entrepreneurs is vanishingly small. You might be able to make this case of Silicon Valley type entrpreneurships. In that case, coding and building new hardware are fairly predictable kinds of endeavors. You *can* work extra hard and code yourself into exhaustion and the results of your coding depend solely on your energy level and cleverness. You *can* design the next great iPhone device given Moore’s Law and the industrial engineers at Foxcomm who will rejigger the machines to your exacting specifications. But this doesn’t work in biotech or pharmaceuticals because we don’t know what the f^(* we’re working with yet. What the finance people don’t seem to get yet is that if they force the scientists into the entrepreneur environment without a safety net of any kind, they are going to get back LESS, not more innovation than they would have gotten than if they had provided us with steady salaries over a long period of time. The problem is that it is hard to prove a negative. There will be some innovation. Some people will get lucky, independent of how much work they do. Some people will have a breakthrough and it will seem miraculous. The problem is that biology is so big and contains so many unanswered questions that the number of innovations that come out of just allowing people to work themselves to death without any visible means of support is going to be tiny compared to what the actual output could be. And maybe that’s not important to the financiers who only want a handful of blockbuster drugs to make their billions off of. But for patients with crippling diseases of all kinds, this period of just letting hard work be the main propulsion for innovation is going to be a tragic missed opportunity. For some inexplicable reason probably having to do with the necessity of rationalizing why financiers and shareholders should take everything that isn’t nailed down to the detriment of everyone else’s livelihoods, the middle aged conservative is convinced that the rate limiting step when it comes to biotech is hard work. If only those overpaid scientists would get off their fat asses and crank out more stuff or whatever it is they do in those labs, there would be more innovative discoveries to sell! What’s really amazing is that they seem to have forgotten the billions of dollars large companies have spent on research on drugs that were never approved. How is cutting back the research budget to zero supposed to work anyway?? One of these days, the middle aged conservative guy’s perspective is going to become discredited. It will happen just about the time France and Germany become the world’s leaders in biotech. While we starve the innovators, the cuddly governments will keep the fires going, allowing more innovation to happen without killing the innovators from exhaustion and bankruptcy. Why wait? Why not just have the government step in now and put our scientists to work? Pay them decent salaries, put a floor beneath them so they don’t fall through it and fund research. Sooner or later, it’s going to have to happen. It is time for American finance people to come to terms with biological research as being a fixed cost, not a variable one and certainly not one that can do it all by itself. Ain’t gunna happen. It hasn’t been good over at Targacept. They had a big antidepressant failure a while back, and last month ended development of an ADHD drug, the nicotinic acetylcholine receptor ligand TC-5619. They cut back staff back in the spring, and the CEO departed. Now the expected has happened: the company has apparently laid off everyone in research, and is conserving what cash it has to try to get something to the deal-making point. A sad, but familiar story in this business. . .sometimes companies come back after this point, and sometimes the event horizon turns out to have been passed. More hard workers, probably a lot of Asians, scrambling for work on a daily basis is not a winning formula.